I’m pinching myself. 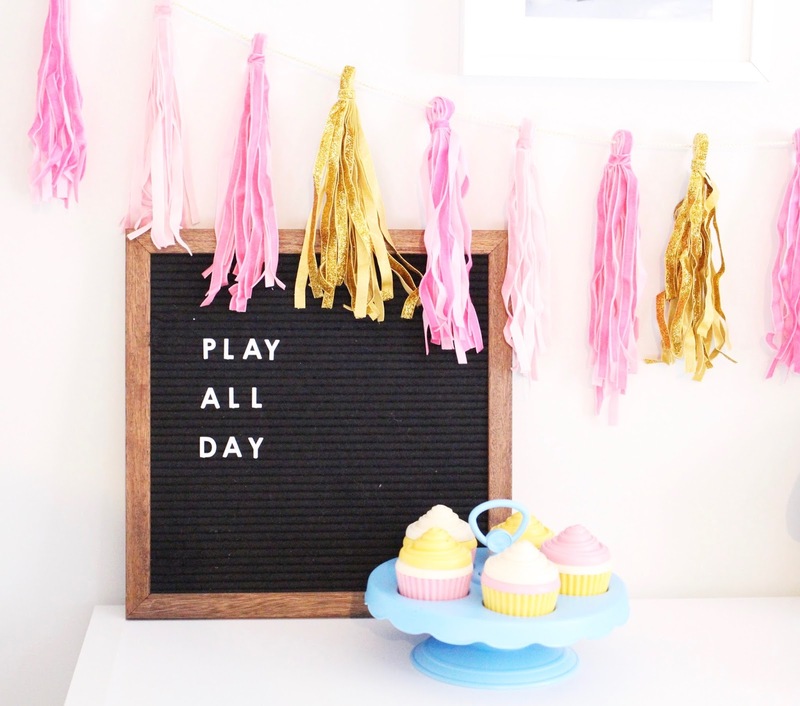 We have an official playroom! Ever since we built this house we’ve been dreaming of the day when we could finish our basement. It’s massive, cold, and basically a place for the kids to jump on the trampoline and for us to store all our junk. The thought of making over our gigantic basement was just way too overwhelming. So, we decided to start with just one room and go from there. And I am SO glad we did. 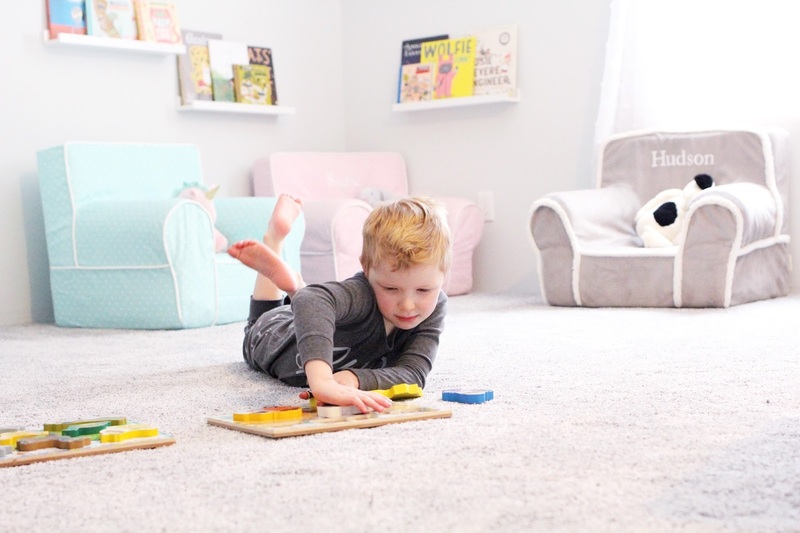 I partnered with Mohawk Flooring and used their hypoallergenic Air.o Unified Soft Flooring (USF) to complete the space and it turned out so perfect! 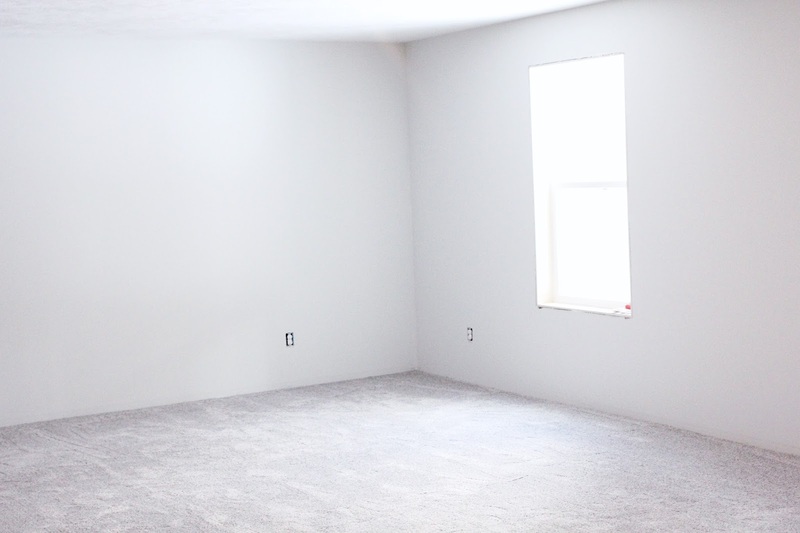 Here is what our basement corner room looked like before we started. You can’t see in this photo, but only two walls had drywall, the other two were just framed out. 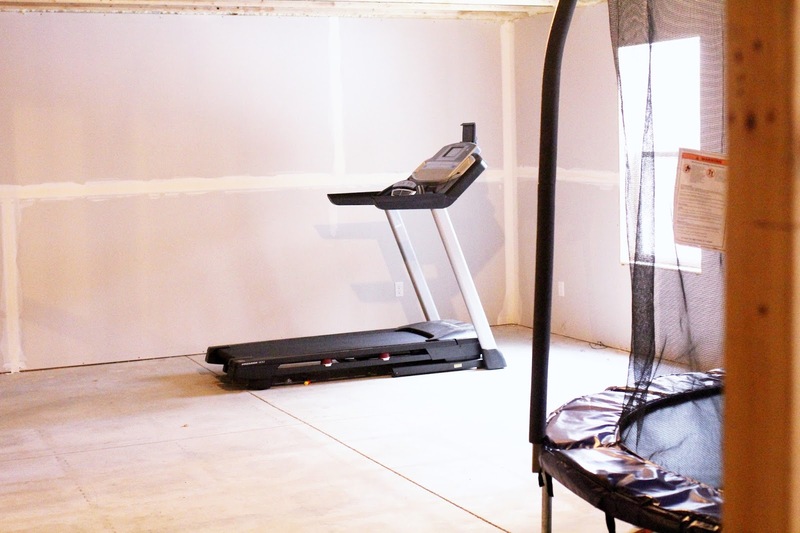 We used this room for our treadmill, the kid’s giant trampoline, and my husband’s video games. Jon works from home one day a week and typically uses this room, so we knew it would be a great place to start. I also wanted to utilize this giant room more. 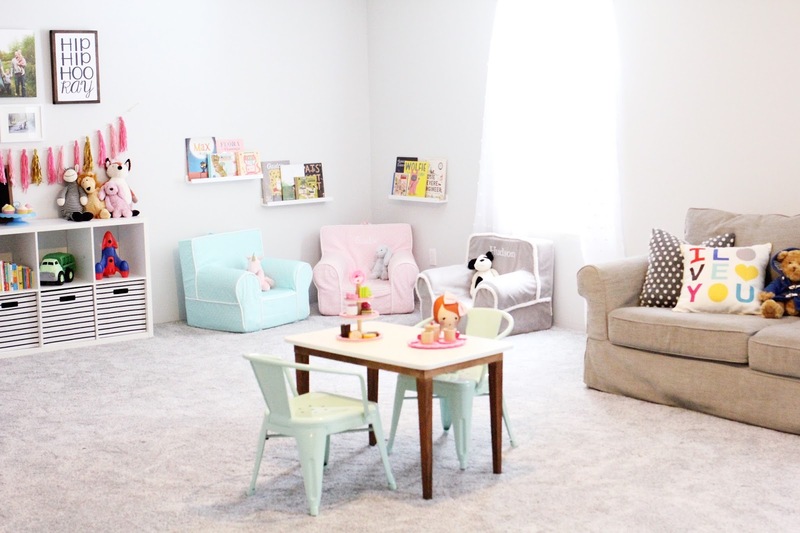 I wanted a place where the kids could comfortably play with their toys and have enough room to run around and burn some energy during the winter! To get started I hired a company to complete the drywall for us and then my mom and Jon painted the walls for me (I’m so lucky to have their help!). The paint is called Grey Owl. Then the Air.o flooring was installed by Verhey Carpets East….and my entire family is in love with it! 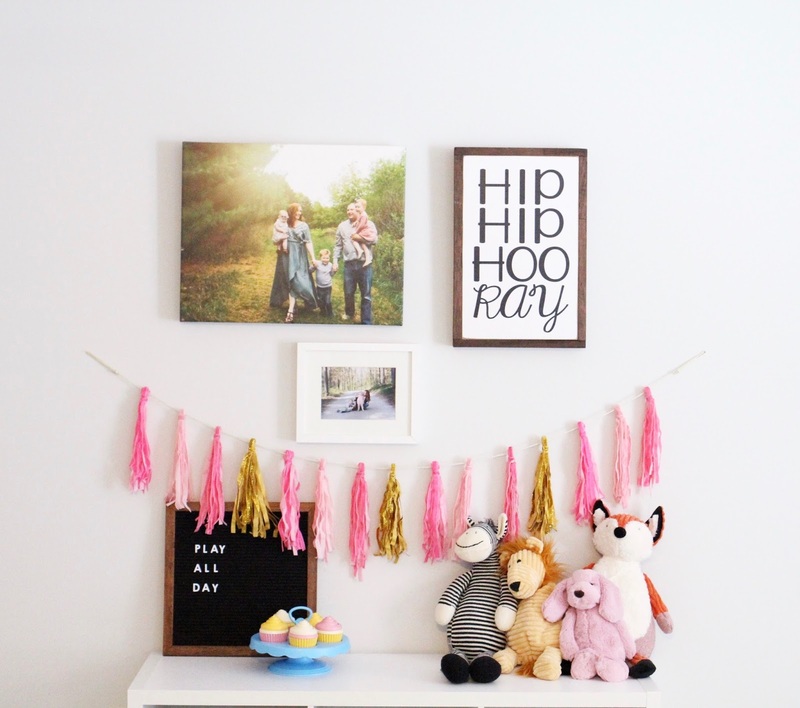 I chose Air.o for this space because our basement is so cold and really needs soft flooring to help warm it up! We’ve always had issues with carpet because Jon has a lot of allergies, so we were thrilled to learn that this flooring is hypoallergenic. 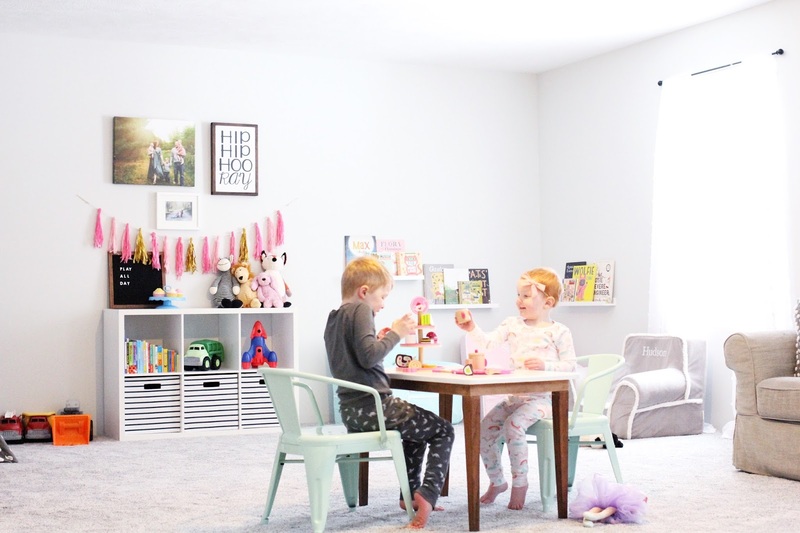 Air.o’s fibers and integrated cushion do not absorb moisture, so it dries faster and more completely after spills and cleaning…which is perfect for a basement playroom! It also means that mold, mildew, and other allergens that require moisture to grow and spread won’t be an issue with this flooring. 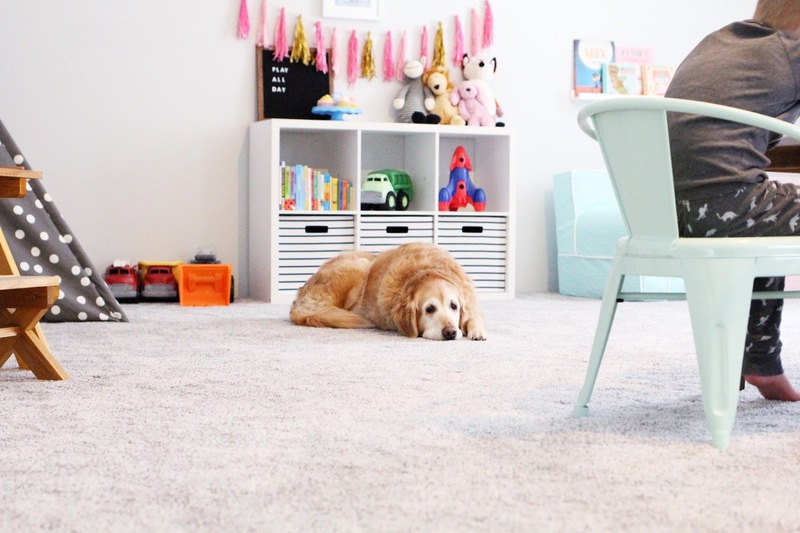 Air.o’s unique construction provides superior airflow to your flooring, which helps release dirt, dust, and soil from the floor when you vacuum, leaving you with a cleaner home. 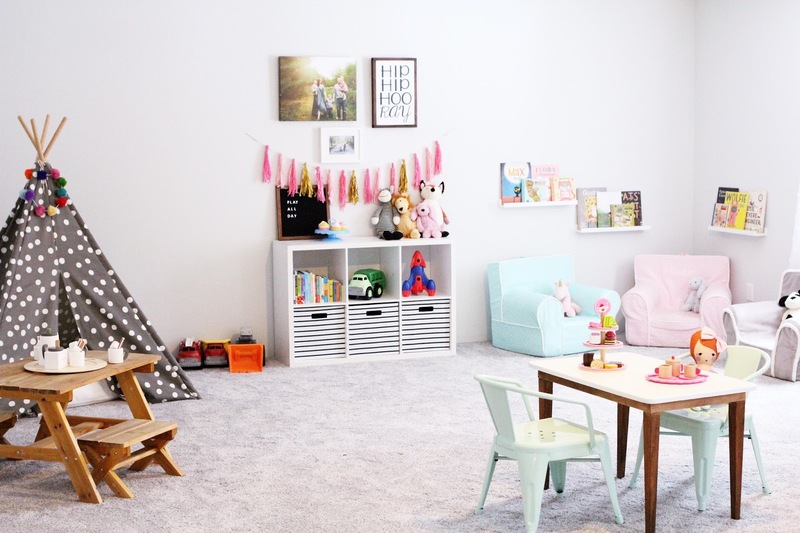 And here’s the playroom now. It turned out so amazing and the kids are so excited! 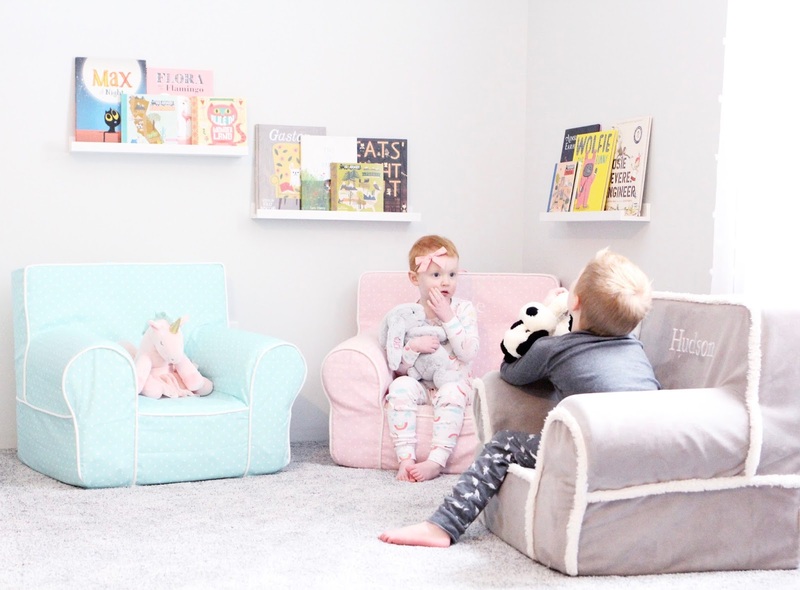 This little reading nook is my favorite! 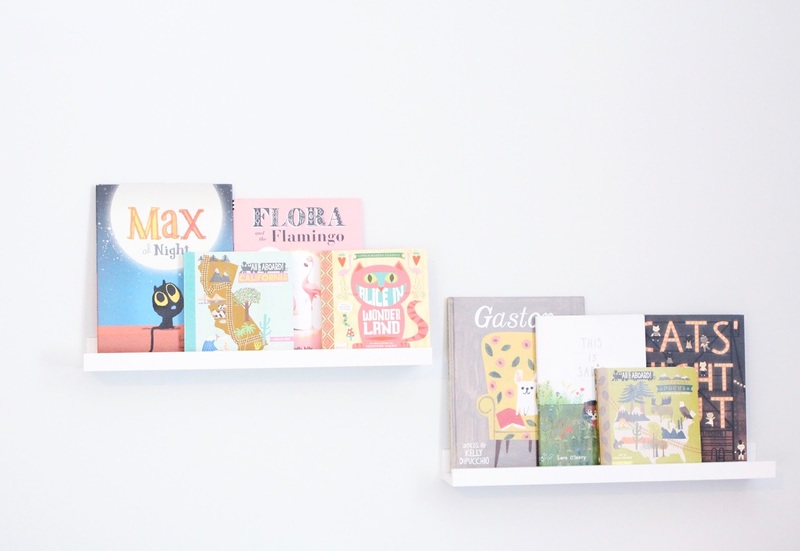 I’ve been wanting to add these book ledges to a space in our home for forever and this was the perfect spot. The kids love having their books on display. Let’s see how long it stays looking this cute. 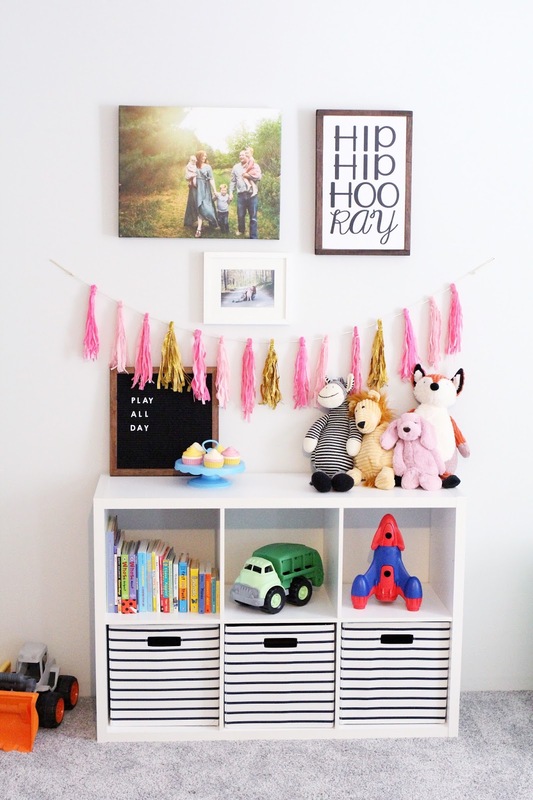 Toy storage was a must for this room. We have toys EVERYWHERE and I’m so excited to have a dedicated space for them! Play all day is the motto in our house. It’s crazy how much brighter this room is now that we have paint and flooring. I have big plans to make this corner the “camp out” section of the playroom. 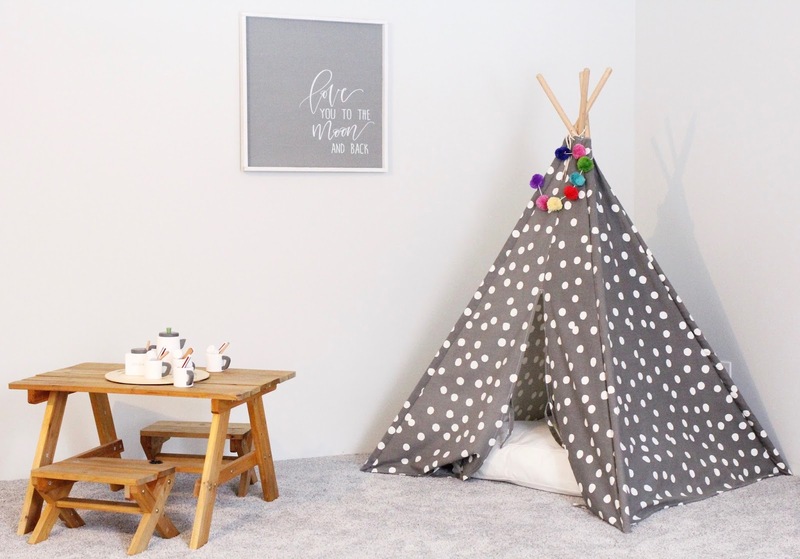 I’m so excited to have the perfect spot for our teepee. Wrigley is loving the new space and carpet too. I am so happy with our choice of flooring for this room. Air.o is latex, odor, and VOC-free and I noticed right away that there was no new flooring smell after it was installed. The flooring has tension-free construction, so it lays flat as soon as it’s unrolled. Once it’s down, it will stay flat forever! Such a great investment – and perfect for a family like ours. Check out Air.o flooring and you could win $1,000 to use toward flooring in your home. 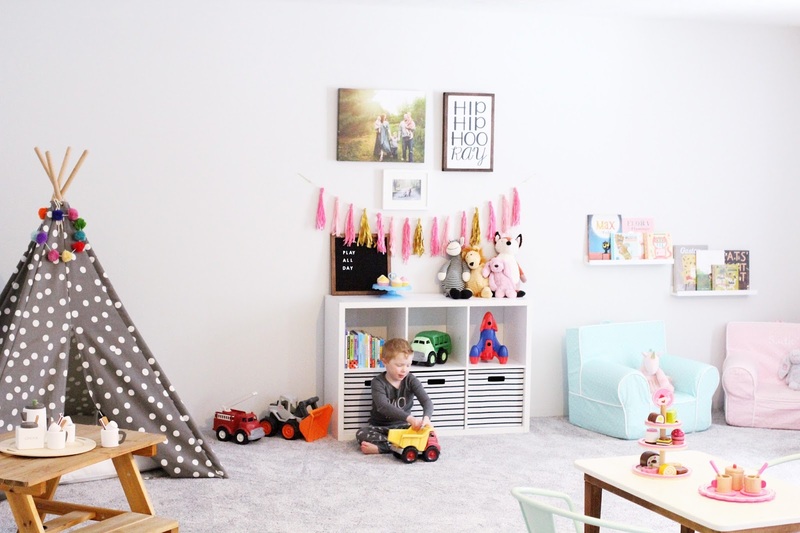 I am thrilled with how the playroom turned out! I know we will enjoy this room for many years to come. What a dreamy and beautiful space! It turned out perfectly, friend! Are the kids thrilled? Love this room! Do you know what the color of the carpet is? They only have like 100 lol! I'm thinking of this for my living room. 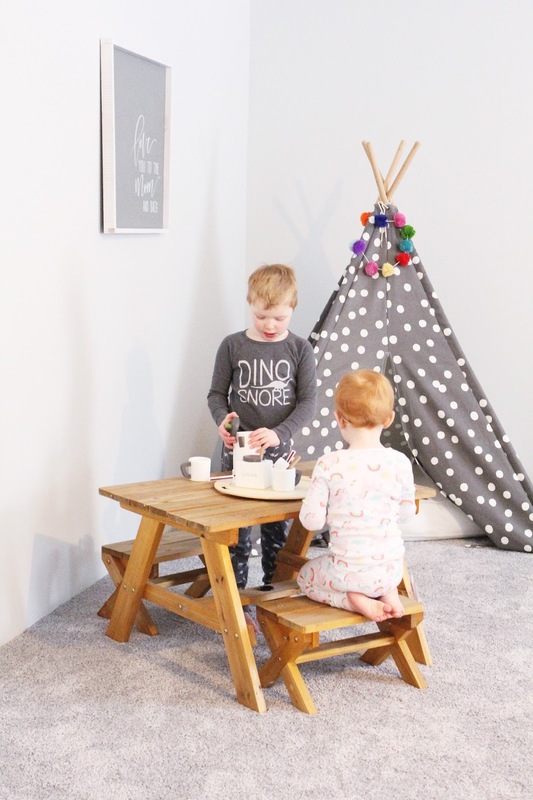 What a wonderful space for your children! Oh my goodness! How adorable! 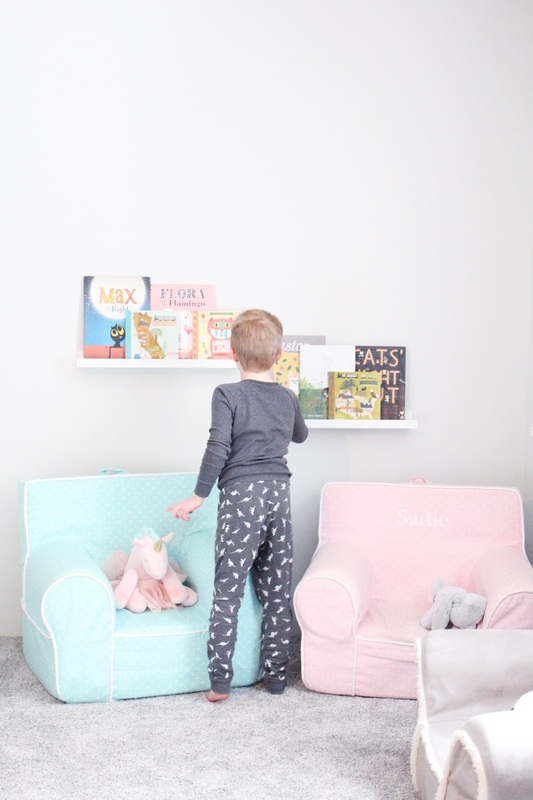 LOVE those sweet little book shelves! I love the soft gray on the wall. It looks so great! What a transformation. And that flooring sounds amazing!